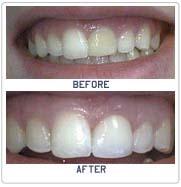 Your cosmetic dentist will usually be able to spot problem areas in your mouth that might lead to tooth damage and a need for crowns. Chewing patterns play a big role as well. By selectively grinding the tips of your middle and back teeth (called cusps) will alter your bite to reduce the stress on at-risk teeth. In other instances, crowns are used to replace a actual missing tooth. These crowns are anchored to the teeth on either side, with a bridge section connecting the two crowns. Instead of bridges, single tooth dental implants may be used that eliminate the need for supporting the crowns.